This public residential high school located in Hot Springs, Arkansas, is designed for gifted students with an interest in science and mathematics. One of only 16 residential science and math high schools in the country, ASMSA has long served as an instructional model for many STEM schools and programs in the state. A widely popular out-of-school program, FIRST® Robotics inspires youth ages 6 to 18 to learn and apply STEM principles through the fun of robotics as well as friendly competition. Composed of university-based STEM Centers, this Arkansas network serves as a valuable training resource for math and science teachers at the elementary and secondary level. Each STEM Center features a specialist and offers ongoing professional development to teachers so they can effectively deliver engaging STEM-related instruction. The University of Arkansas at Pine Bluff, a historically black college, has become one of the region’s leading STEM institutions. Its STEM Scholars Academy is helping expand the number of Arkansas students with STEM degrees and certificates, particularly for women and students of color. The Environmental and Spatial Technology (EAST) Initiative, a school-within-a-school STEM program, began as one classroom in Greenbrier, Arkansas, in 1996. More than 20 years later, EAST now serves 220 schools in five states. EAST students work in teams and use technology, creativity, and the STEM-based knowledge they acquire to solve problems they see in their communities. Active in 150 schools across 26 states, the New Tech Network is a national nonprofit school development organization that began working with a pilot group of Arkansas school districts in 2012. New Tech schools emphasize project-based, hands-on learning and teaching 21st century skills. Personal computers and other technology also play a prominent role in the New Tech classroom. A national teacher recruitment and training program, Arkansas has implemented UTeach to strengthen the STEM pipeline at the college level and improve the quality of K–12 STEM education. Three Arkansas universities are recruiting incoming freshmen and offering them attractive incentives like early field experiences and the opportunity to study under veteran master teachers. Project Lead the Way (PLTW) is a national program that offers practical training to middle and high school students interested in engineering, biomedical sciences, and other STEM-related subjects. Active at 20 Arkansas sites, PLTW is putting students on track toward college degrees and technical certificates in STEM fields. 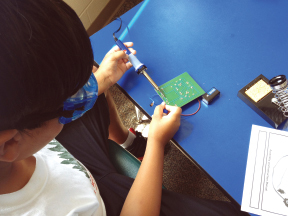 STEM instruction must be relevant and designed to connect personally with students and in ways that take them out of the classroom—figuratively and literally. Successful STEM programs challenge both teachers and students to identify real-world applications for what they're learning. STEM-based programs and schools using this approach prefer facilitation over lectures. Teachers guide students to address real-world problems that can only be solved through self-initiative and creative application of STEM principles. Inquiry-based learning also prioritizes teamwork and the integration of modern technology as a part of the learning experience. Successful STEM schools and programs depend on a high level of training and ongoing professional development for teachers. STEM-centered summer institutes and training sessions for teachers are crucial, as are the coaching and personal feedback that mentor networks provide teachers throughout the school year. What's Working in STEM Education in Arkansas shares models from how Arkansas educators have prepared students to become highly-qualified STEM professional that communities across the U.S. can learn from. We encourage you to call or visit each of these Bright Spots to learn more. Also, Arkansans are committed to continuous improvement by learning from other communities' and state's innovative approaches. Reach out to the Winthrop Rockefeller Foundation at programstaff@wrfound.org to share what's working in your community as well.